Share the post "Diane’s Vent – A Seafloor Tribute to Diane Adams"
On November 2017 the Woods Hole Oceanographic Institution lead an expedition to some recently discovered hydrothermal vents fields in the Gulf of California. During this expedition they placed a special marker near one of the active vents in memory of Rutgers Department of Marine and Coastal Sciences colleague and friend Diane Adams, who passed away in June 2017. The vent, formerly called the “PBS vent”, has now been renamed as “Diane’s Vent”. Diane’s research focused, among others, on larval dispersal near hydrothermal vents. This monument is a fitting tribute to her scientific legacy, her deep love for hydrothermal vents, and the lasting impact she has had as a colleague and friend on those who were lucky enough to cross paths with her. To watch a video to see the deployment, learn about Diane’s work and life, and watch a mesmerizing hydrothermal candle lighting up the seafloor in her memory, visit the Department of Marine and Coastal Sciences website. Why we study these vents: The research that is being done at vent sites such as Diane’s Vent is helps scientists to understand why some species can travel in their larval stages from vent to vent, while other cannot. It helps us to figure out what makes the ecosystems at hydrothermal vents unique. Such knowledge provides an important framework to support management and conservation of deep-sea habitats, and to protect these seafloor ecosystems from damages due to deep-sea mining. 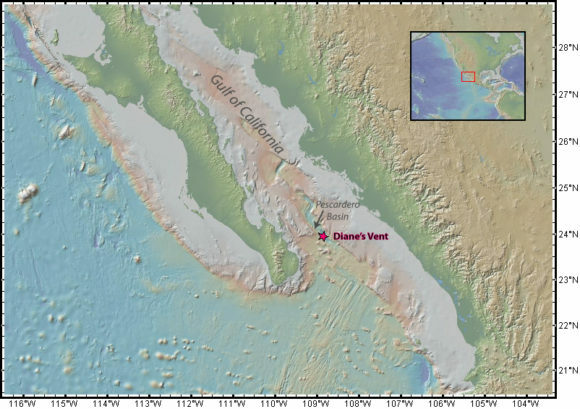 Discovery: The vent field was first directly observed by researchers from the Monterrey Bay Aquarium using an ROV (Remotely Operated Vehicle) in 2015. A Russian expedition in 1990 was likely the first to report hydrothermal activity in this area based on water column temperature and chemical anomalies. Chemistry: Vent fluids appear white or translucent, indicating that there is little sulfide precipitation at the vent orifice. Instead the chimneys are composed of white and brown hydrothermal calcite. The fluids are rich in aromatic hydrocarbon, hydrogen, methane and hydrogen sulfide – a perfect mix for biota to thrive near this vent. The pH values of ~6.5 are some of the highest reported for deep sea hydrothermal vents. Biota: The vent field hosts many previously unknown species that are unique to these vents. The fauna is dominated by polychaete worms, including a tube worm (Oasisia aff. alvinae) that bears striking similarity to tube worms of the Pacific Northeast vent fields. Growing among the tube worms are anemones and clams, while crabs and gastropods are curiously absent. The reason for this unique fauna does not seem to be related to larval dispersal – something that Diane studied – but rather the unusual substrate, vent fluid chemistry and geological setting of these vent sites.